Castleford03456 018 353work TownIn the north east of the district, Castleford is where the Romans crossed the River Aire and built a notable fort to protect this important crossing point. Much of Castleford's cultural heritage lies buried deep in the earth: as well as the extensive evidence of the Roman occupation, there are many coal seams. Its economic horizons have changed drastically since the 1980s with the demolition of its six pitheads, but the robust spirit of the coalmining community has helped the town adapt to change and create exciting plans for the future of the town centre. On Castleford's coat of arms these ancient and modern influences are represented by a miner's lamp hung from the collar of a Roman eagle. The motto reads 'Boldly and Frankly' and Castleford people have a reputation for being among Yorkshire's friendliest. The glass bottle industry grew up in the 19th century and Castleford became the largest glass manufacturing town in Britain. By the 1850's 20,000,000 glass jars and bottles were produced every year. The pottery industry started in 1790 when Dunderdale & Co were established, who became famous for their fine ware pottery and stoneware, particularly Castleford teapots in white and black, which are now collectable items. The public Road Bridge over the River Calder, at Lock Lane, Castleford is one of the few major structures of any antiquity, which has survived. Dated on parapets, 1805, by Bernard Hartley, built 1808 by Jesse Hartley. Internationally renowned sculptor, Henry Moore was born in Castleford in 1898. Examples of his work can be found throughout the district. Castleford is also the home of Allinson's flour, which is stone ground on the banks of the River Aire; many exclusive Burberry lines sold the world over start life at the company's factory in the town. Today Castleford is more celebrated for its famous rugby league team - The Tigers, its Designer Outlet Village - Junction 32, and the exciting snow-based leisure complex - Xscape. Bridge Arts is at the heart of the community providing exhibition and meeting space for the many thriving arts and heritage groups in the area. 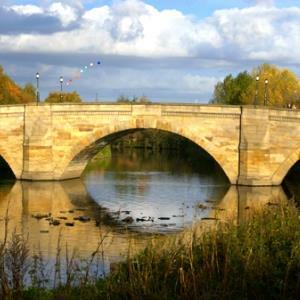 In the north east of the district, Castleford is where the Romans crossed the River Aire and built a notable fort to protect this important crossing point. Castleford has a new landmark, a bridge designed and constructed with the help of the commuity. The production was filmed as part of 'The Castleford Project', a Chanel 4 TV production, hosted by Kevin McCloud, which aired in 2008.